Its hard to believe that it is once again time for the Bloggers Quilt Festival. 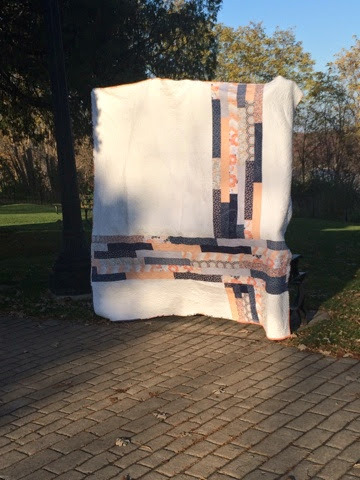 This fall I am showing off a quilt that took me about 10 months from start to finish. - we will not discuss how often it was tossed off to the side. It may have taken me 3 months to sew the binding on.... Since I am not good at naming or labeling my quilts I came up with the first thing that came to mind. I cut the fabric in Washington at a friends house, It was pieced together in Oregon and Alaska. I had it quilted by Melissa in Utah and I am taking final pictures of the quilt in Minnesota. I based my pattern loosely on this pattern Desert Arrows by Leah Duncan I made the pattern larger (I need to STOP doing this) I changed the border. I am also incapable of following my own plan. I took several pictures once I was happy with the layout I then managed to sew several of the blocks and a few rows upside down. I did lots of unpicking and then I reached the point where I was just done. It took me another month or two to piece the back. I took several pictures of this quilt while I was making it. Do I have many to show you? No, it appears in my zeal to clear up space on my computer I deleted all of my pictures (insert choice words here). I did find a few on my phone. 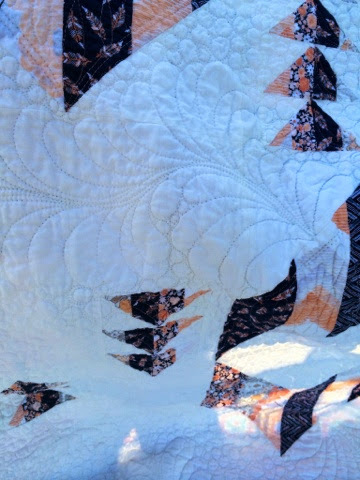 One of the ways I made this quilt bigger was by adding my own border of flying geese to the sides in a random manner. I found a tutorial online and then I shrank it down - because that is the cuter/harder way to make your quilt bigger. I managed to finish up the cathedral window pillow I started at Camp-Stichalot two weeks ago. I had a friend who wanted to learn how to make this block so I did some of my cutting before I went and I took lots of scraps with me. Here is a progress shot I lost a square on my way to the ironing board. When I took my class with Bari she could not express how much she loved glue basting. I must say it was a huge game changer for this application. I am not sure I will use it for other things but who knows. It really stopped the squares from moving around on me when I was turning over the edges to sew down the curves. I finished the back of the pillow with a simple envelope closing using straight line stitching about every 3rd of an inch. The only thing I am not overjoyed about is my green squares. I used more blue than I should have. So I do plan on making another one of these this winter. I plan on donating this pillow to the next Crafters for Courage Auction. This finished up at 14 X 28. Thanks for stopping by. When I get off work tonight I have an unrealistic list waiting for me. Hopefully I can cross at least one sewing item off by Sunday. Linking up with Amanda Jean at Crazy Mom Quilts for Finish it Up Friday. I just returned from Camp Stichalot. I had an absolute blast. This was my second camp and if I could I would go each time they had a class. - But since it requires taking 4 days off of work, 8-9 hours of flying each direction and budgeting I will settle for once a year. This camp we had two instructors. Bari J and Vanessa Christenson. They are wonderful teachers and hilarious to be around. The finish I have to show you this week is my Holiday In London Duffle Bag. I did not make my bag according to the directions - there it is a possibility that I was not reading the instructions, did not have enough sleep, and I may have been drinking a beverage made by Vicky at House of Duke ....None the less I am happy with how it turned out. Close up of quilting - it is important to quilt prior to cutting out your pattern pieces. I can honestly say I did this part correctly. Here is a peak at the inside - and in the event that you accidently sew your lining to the outside of the bag you can still have a finished bag inside by binding your seams. Sure it is extra work however, I was at odds with my sewing machine the whole weekend and I did not feel like doing any more un-sewing. I even had Bari sign the inside of my bag, but with the text print it is pretty hard to see. It is just to the right of the beginning of the middle pocket. I do hope to make another one of these bags soon. Hopefully I will manage to follow Bari's instructions better the second time. Linking up with Amanda Jean for Finish it up Friday. I am off to finish up the pillow I started at camp with Vanessa. Of course I also have 4 quilts that I need to get around to quilting. 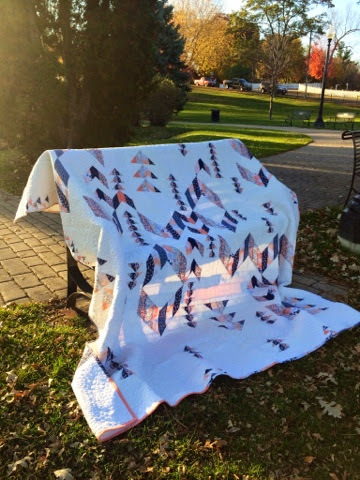 I recently had the pleasure of testing a pattern for Rossie at Fresh Modern Quilts. I had a blast making this quilt top. I really enjoyed laying out the colors trying to figure out where to place different hexagons. Her pattern tells you how to piece the inset hexagons without any Y seams. It is up to you to determine the lay out. This worked really well for me as I am always changing the pattern in front of me. Currently the pattern is available only at the Modern Quilt Guild to current and new members. It is my understanding it will be available later in the year. Here is the first block I did. I used Bella Grey for my background and my striped fabric is Michael Miller Free Style. All of the other solids you see came from my stash. I changed my layout several times and kept adding hexagons. Once I was happy I began working on putting everything back together. I took this picture behind the quilt because I just loved how all of the light was filtering in. This weekend I am going to finish piecing the back. I have figured out the design I want for the back, I just need to execute my plan and hope it turns out how I have it pictured in my head. I will then face my next fear - free motion quilting all of the negative space. I hope to do several straight lines and echoing in it. I am hoping I do not spend the next month ripping it out and I have made myself a promise that I will not do loops. I may or may not need a lemon drop to begin the quilting process. I promise to report back of my success or tell you about my "learning opportunity"
I have finally finished my EPP pillow. I am sending it off this weekend and I hope that my partner for the Modern She Made Swap enjoys it. I have also joined the Supernova Friendship Block Swap over at the Late Night Quilter & One Million Stitches I have teamed up with Jennifer who blogs at The Quilted Cat We are going to be making our quilt with Denyse Schmidt's Ansona Fabric. It is not too late to join - your first blocks are due on June 15th. Thanks for stopping by - I am linking up with Amanda for Finish it up Friday. I am participating Amy's Blogger's Festival - I am entering my quilt in the Large Quilts category. I love this quilt now - however, it was not the quilt that I originally wanted to make. As soon as I began seeing Tula Pink's Saltwater fabric come out I knew I had to make a quilt for my self. I quickly decided that this was the quilt for me. I ordered the kit, I was so excited when the kit came, I opened it and discovered 1008 neatly cut hexagons - Oh! I had planned on making a queen size quilt. I did the math - I needed 3 more kits... then I began to read the instructions, English Paper Piecing (EPP)- I realized, they think I am going to sew this by hand. Several swear words came out. I placed the kit under my desk and began to look for a new plan. The pattern can be found here. I did make the quilt bigger than the pattern called for. For the back I used my left over pieces of fabric. And here are my irritated quilt holders - the sun was not cooperating so this was the third time I had taken my son out to take pictures of the quilt. My son took pictures the first two times and he was either taking partial shots of the quilt, or of the running water - "in the interest of making it more interesting" He did take the 3rd and 4th picture as well as the pictures of running water below. Clearly he knows how to use the camera better than his mom who has not yet taken it out of automatic mode. I recently did a swap in the theme of hexagons - I tried EPP for the first time and I found myself actually enjoying the process - I will admit that hand sewing and enjoyment are not yet used in the same sentence with me, but it was not as awful as I thought it would be and it helps pass the time when on an airplane. I have since dragged out my kit and I will be slowly working on making the original quilt I wanted - just don't expect to see it completed anytime soon. My daughter wanted to take a class at my local quilt store - it was a class for cathedral windows. She just turned 13 this week and while she is good at sewing but I was not sure she would have the patience for the class - she persisted in harassing me so we both signed up. At the beginning of the class she was excited - an hour later when we were still pressing and folding she started shutting down. It had too much prep work to keep her interested. Below is the pillow I made in class. After I made this pillow I really wanted to try something else. - I saw this pillow by Josh and Paise I think it is absolutely amazing. I wanted to see if I could make one similar. The process was somewhat frustrating - I ripped out my first attempt as the proportions were off. I wanted more pale yellow and less of the medium orange - I spent almost 2 hours carefully ripping out and redoing the center to move it all a quarter inch. I have less of the medium orange, more of the bright orange and just a tad bit more of the pale yellow. IF I was to make this pillow again I would make more changes to my measurements..... However I am not in a hurry to make another one of these anytime soon. I used the Rosco Color Stack the color is a little off in this picture - I was just so happy the sun was out. I even got to spend some time on this chair over the weekend working on my EPP project. I used the left over fabric scraps to piece the back. I saw a picture that Elizabeth Hartman posted on Instagram the other day and thought it would be fun to try. I then did straight line quilting on the back. I am having a hard time giving up this pillow. I have a friend who just moved away and I wanted to make her something for her new home. She told me her new living room is going to be all cream and grey. - The joys of not having teenagers who destroy living areas. Below is where my daughter left off on her pillow. I am hoping I can get her to finish it soon. I only have one more pillow to make this week - at some point I thought it would be a good idea so EPP 120 hexagons together, then decided I wanted to inset the whole thing within a larger hexagon. I had to order more fabric as I made a cutting error. I hope to show pictures of that pillow soon. I have reached the stage where I just want it done. I am linking up with Amanda at Crazy Mom Quilts. Thanks for stopping by and I hope you have a wonderful week.